Title: KCS 3 "PITTSBURG "
Description: On a run from Atchison, KS-Kansas City over the BNSF's ex-CB&Q line. Here, it's seen crossing the Platte River. The Missouri river is about a mile to the west of here. Description: I met up with the Holiday Express in Vicksburg, MS. Description: For the event, the Holiday Express was parked behind the YMV depot. Description: It's getting close to departure time! Description: The final minutes of the Holiday Express' visit to Vicksburg. The timed exposure yields an erie smoke and light effect. Description: Riding the twists & turns upgrade at Gillham, AR. Description: Another nice view of the headend as we continue north for Mena, AR. Description: The grade is beginning to get steep outside Wicks. Description: A lone railfan takes pictures as we pass through Wicks, AR. Description: Close to our destination near Mena, AR. Description: Heading through Fickinger Street is KCS 2 taking a rare turn on the point of the Southern Belle Business Train as the Holiday Express heads for tonight's display in Noel, MO. Description: The KCS 2008 Holiday Express rolls into Noel for tonight's display in front of the ex-KCS Depot. Description: Making our way through KCS Heavener Yard. Description: Rounding the curve near the Howe crossovers below Forest Hill. Description: 9.1.7 - Diverging Approach at the Howe Crossover. Description: Passing through Marble City with a clear at the NSS. Description: The Holiday Express has arrived at Noel, and now pulls up to position the train for display. 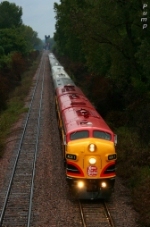 Description: The Holiday Express approaches the south end of the Noel siding, seen across the field from Deer Creek Rd. Description: The Noel station is now the City Hall, flying American and Missouri flags, seen above the train as it arrives. Description: The Holiday Express brings out the locals, and also folks from a long way off. A sampling of the local youth watches as the train pulls past the old station as it arrives from the south. Description: The Heavener Sub follows a creek from just north of Decatur to just south of Gravette. In this valley is the Dorsey siding. Just north of N Dorsey, we see the Holiday Express behind the executive Fs. Description: The KCS Fs lead the Holiday Express as it eases past the Noel station. It will cut off the display cars and back them into the siding for the crowd to tour. Description: The Holiday Express rolls past the station at Noel to a stop as it arrives for the days festivities here. It was chilly, but sunny, making for a good day to tour the train. Description: KCS 2, 3, 1 with Santa Train with one of my boys taking a video. Description: Snow falls as the temps drop at Knoche Yard in Kansas City. Description: Cars in the photos from the fore ground, BATONE ROUGE, NEW ORLEANS, DALLAS, ST LOUIS and HEAVENER. Description: On a VERY cold morning in Blue Springs, MO, the Holiday Express is set up to be featured on a local news morning show. Description: The SOUTHERN BELLE in Mexico, MO. Description: A very cold morning in Roodhouse, IL. Description: Getting ready to turn the wye in Roodhouse. Description: The KCS F units return from Knoche Yard with the company's newest business car, the deluxe sleeper LAZARO CARDENAS. Description: The LAZARO CARDENAS - "Laz", and the SOUTHERN BELLE F units on the KCT. This was shot from the Laz's sister car, the deluxe sleeper SAN LUIS POTOSI - "SLP". Title: My Parting Shot. This one's for you Kenneth!!! Description: The business train stops at Southwest Jct. while changing crews. It will get a DME Crew here to take the train on its way to Bensenville, IL, a suburb of Chicago to meet with CP Officials about through traffic agreements. Description: Headed off the Truman Bridge is the KCS Business Train running up the DME South. The train is on its way to Bensenville, IL, a suburb of Chicago to meet with CP Officials about through traffic agreements. Description: KCS train just north of Lawson Jct. on the DME South. The train is on its way to Bensenville, IL, a suburb of Chicago to meet with CP Officials about through traffic agreements.